s2Member is a wordpress plugin, which contains the free s2Member Framework and the Pro Add-on. They help to turn your website into a private online club or a community. If you are still considering whether to try this membership plugin or not, here’s my s2Member Pro review. You need to purchase the Pro version if you want to take full advantages of this plugin. That’s why the review is on s2Member Pro instead of the free version. I have used this membership plugin for a few years so I have to admit this is one of my favorite plugins. And in this s2Member review, I am going to talk about the features, pricing, and some of my experience in using s2Member Pro plugin. I hope my s2Member.com review can help you to make the right choice. s2Member Pro has a variety of features, maybe even more functionality than what you need. 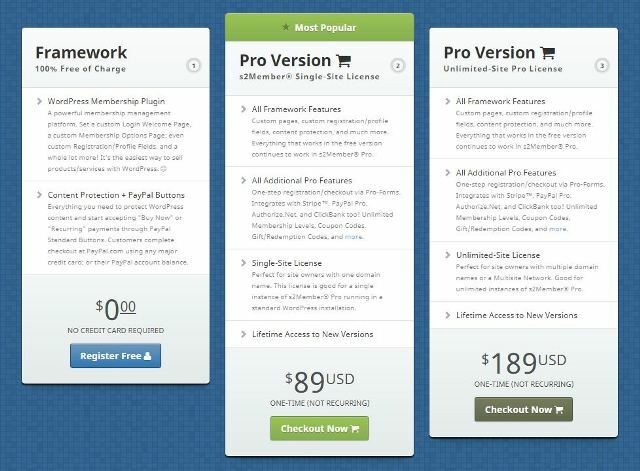 Actually s2Member Pro is the most flexible Membership plugin available for wordpress. One feature which I find really effective is that s2 Member Pro provides for creating specific ‘Buy Now’ products that can be added to any membership level. This helps you to release products without relying on an existing membership and can be purchased by both new subscribers and existing members of any membership level. Another similar feature is that it allows you to sell specific posts/pages or packages, totally not related to membership. For example you can protect a page, create a buy now link for it, and decide how long the page link is available for someone. When someone buys they are taken straight to the protected contents no login needed. This is what makes this feature so helpful. You can even offer one time offers on login for member. s2Member Pro gives you unlimited paid membership levels, and also supports a free membership level with open registration. Membership levels are technically ranged so membership level 2 can access membership level 1 as well. So it is hard to completely separate all membership levels but I don’t think this is a problem. I also find it really easy to customize your login and registration pages, including adding custom registration fields. This is the reason why I enjoy this plugin so much. Even the welcome email templates are easy to design in your own way. You can also select from any of your pages for both the membership options page and membership welcome page. You’ll get a login widget too, which can be added to sidebars or footers. If you want to use PayPal Pro for payment then s2 Member Pro makes it easy to create shortcodes for pretty much any pricing structure you can imagine. And it is not difficult to make a few style changes the way you want so that these forms are not only useful but they look good too. You can also make coupon codes easily and you can decide whether you want a user to create their username and password during the payment process, or have it emailed separately. Shortcodes are what S2Member use to control its functionality. You can hide content on a public page so that only logged in members see it with a shortcode. You need to have content dripped so that it appears to members over time. A shortcode can help you with that. Shortcodes can even help you to create a member profile editing page easily. If you want to set up a site using WordPress multisite, then s2 Member is absolutely appropriate with this right out of the box and works perfectly. So your own site empire is now possible. Beside the obvious protection of pages, posts, categories etc, s2Member will also protect your downloads, including allowing you to limit the number of downloads allowed. Its security features works really effective so that it can help you to stop things like username and link sharing, so your content is as safe as possible with this plugin. Since this plugin has too many features and in this S2Member review I have to admit that it is not easy to master all these features. For example, you can let users upgrade or downgrade their accounts, which is a great feature. But the point is you can’t do it easily. You have to go to the Billing Modification Forms and try finding that. So I think one of the best things about s2Member plugin is that you can do pretty much anything with it, but the downside to this is that that means that there are a lot of set up options. It can be confusing to know which options are necessary and which you can ignore. In fact a lot of the language used isn’t very easy to understand for non-techies. But if you have hours and days to spend learning and figuring S2Member Pro out, then you might be able to take full advantages of its features and enjoy it. But don’t worry, S2Member Pro has some really good training documents and each option also has an explanation along with it. Unlike other plugins where you have to pay money for each update. The price for s2Member Pro is one-time payment so there’s no recurring cost and updates will always be free. You can purchase a single site license for just $89, and an unlimited site license for $189 which I think is reasonable. There is also the free version of this plugin, which is actually not too different from the Pro version, the main difference being that only payment via standard PayPal can be used, you have a limit of 4 membership levels and you can’t create one-time offers. So if you want to use Stripe instead of PayPal, you should purchase s2Member Pro. It’s lucky for you when reading my S2Member plugin review. I can help you save extra 10% – 50% off S2Member Pro. Simply using the s2Member Discount Coupons at checkout process. In my opinion s2Member is pretty ideal for people who have enough time to learn how to use this. The login is the same as the normal WordPress login so there are no issues there, and you can set either one default welcome page or you can set a different page for each membership level. So if you have the time and the interest, you should try this plugin and enjoy its variety of features.